Corner kitchen cabinets are one of the trickiest spaces in a kitchen design and can morph into an abyss of forgotten items. It’s where you currently store the juicer you bought five years ago during your juicing kick, the crock pot you received as a wedding gift, and other forgotten small appliances and kitchen tools. It may seem like this area of kitchen storage is permanently out of reach, but corner kitchen cabinets do not have to be a throwaway space! When properly designed and utilized, they are a treasure trove of useful storage. Years ago, your corner storage options included a Lazy Susan – shelves that spin, allowing access to all sides – and that’s it. Now, there are plenty of clever storage solutions, like angled cabinets, swiveling shelves, and gliding trays that will enable you to maximize the storage value of your corner spaces. Angled corner upper cabinets are a great alternative to small shelves because they provide a little more storage. You can dress them up with glass doors to showcase your favorite mugs or teacups, china, or other important objects. Corner sinks, like this kitchen remodel in Jamison, PA, are a different, yet practical way to effectively use all the space in your kitchen. The additional space behind the sink is a perfect place to store dish washing supplies or add a little extra décor. Additionally, the back corner of the cabinet interior can house plumbing, freeing up additional cabinet storage space. Corner drawers, like this kitchen design in Doylestown, PA, are an interesting and unique option that will add flair to your kitchen design. They provide storage spaces in 45-degree angles, making them ideal to house small items that can fit into the odd angles, such as various cooking utensils or seasoning containers. If you’re feeling more traditional, a Lazy Susan is still a great storage alternative. They allow you to reach into the far depths of your cabinet with just a quick spin! You can house it in two double doors or utilize hinge doors like these. If Lazy Susans aren’t your cup of tea, these shelves are a cool alternative. 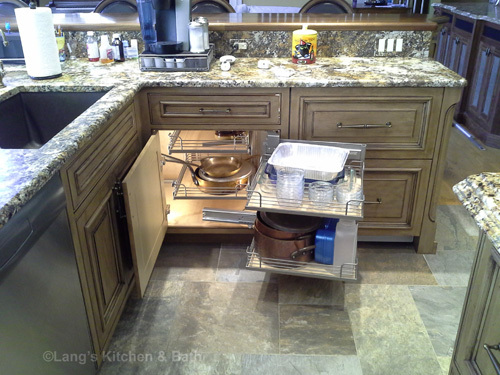 They rotate and slide allowing you to access pots, pans, and small kitchen appliances with ease! Do not write off the corners of your kitchen as lost storage space! As you can see, there are a plethora of corner storage options. Before you undergo a kitchen remodel, Lang’s Kitchen and Bath will help you cipher through them all and help you determine which ones will optimize your space and work best for your family. Call us today at 215-968-5300 or visit our Newtown storefront to learn more about cabinetry or to start the kitchen remodeling process!